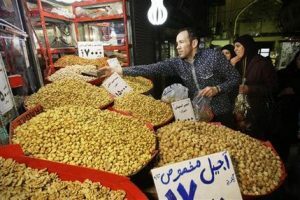 While President Obama and his advisors claim victory over the success of new sanctions against Iran and the sharp decline in the value of the Iranian currency, many Iranians are stockpiling food and other basic staples, anxiously awaiting their uncertain future. “Our money is becoming worthless. We cannot catch up with the rising prices,” an eighty-six year old relative told me. Is President Obama aware of the reality Iranians are subjected to as a result of the US sanctions? The slide in the value of the Iranian rial began weeks ago. It happened with dizzying speed. In a short few weeks, the rial lost much of its value against the dollar and other major currencies. Sold at 11,000 rials in November, the dollar rose some 50% in value by the end of the year. “The dollar will reach 20,000,” was the widespread rumor in the streets of the capital. On January 23rd, the dollar reached 20,000 rials. Food and other prices continued to increase. “Rice-sack currency,” wrote a blogger, referring to the need to carry a bag full of notes to go shopping. For many Iranians, the current decline in the rial brought back memories of similarly anxious days in mid 1990s. I visited Iran during a turbulent time in July 1995 when the rial kept losing value against the dollar. The dollar increased from 1,500 to 3,600 rials in a short period. Panic prevailed everywhere. Discussing the exchange rate was a national pastime. Even children wondered about exchange rates. It was during Moharram, the month of national mourning for the death of Imam Hussein, Shiite Islam’s third Imam some thirteen hundred years ago. The dollar reached 6,500 rials by the end of Moharram. “Did the price of the dollar go up because of the death of Imam Hussein?” my six-year old nephew asked. By the end of the summer, the dollar had reached 7,000 rials. “I am telling you, it will be 10,000 soon. This is how the Americans will get rid of the mullahs,” a cab driver told me. President Clinton had shown a 10,000 rial bill in a press conference, a relative told me. Rumors spread around Tehran that Bill Clinton had announced his readiness to push the dollar up to 10,000 rials to bring down the Islamic Republic. The dollar continued to climb, and four years later, in fall 1999, it exchanged for 10,000 rials. To the disappointment of those dreaming of a regime change, the government of Iran remained. Meanwhile, the rial enjoyed a long period of relative stability. The dollar exchanged for 10,000 rials. All that changed with the new rounds of sanctions. President Clinton’s press conference proved to be the imagination of the Iranians who wished a regime change with the help of the Americans. Bill Clinton did not take credit for the 10,000 rial exchange rate. The turmoil in currency markets was not a part of the American policy. Now, many years later, while President Obama celebrates the success of economic sanctions, there are no enthusiastic rumors about him showing a 20,000 rial note to reporters. Even the most vocal opponents of the government in Iran don’t wish for an intervention and regime change by the United States. Meanwhile, many suffer from President Obama’s sanctions. Trapped between a repressive government, and an outside world uninterested in their lives, ordinary Iranians carry the burden of the sanctions on their shoulders. Usually around this time, Iranians begin preparing for the New Year on the 21st of March. They buy sweets, nuts and dried fruits to treat their visitors, shop for new clothes for their children, do the most thorough spring cleaning. These days, however, anxiety about prices increases and the precipitous decline in the value of the local currency has replaced the joy of the New Year. Anxious about the future, middle class Iranians are filling up their freezers with meat, vegetables, and other food, and storing rice, laundry detergent, and all that they can store. Some thirty years ago during the war between Iran and Iraq many Iranians bought large freezers and stockpiled meat and other food stuff in fear of anticipated shortages. The war ended, and as time passed, some unplugged their valued freezers. Now, many years later, with the rising prices of food, and the fear of another war, the freezers are once again plugged in. Others are emptying their bank accounts and buying dollars. There are no coping mechanisms however for workers and most other Iranians without savings or cash in the bank. Cash strapped, and already struggling to survive the odds of an ailing economy, waiting is all they have in their arsenal. Factory closures and the non-payment of wages will be their gift from the United States this coming New Year. I wonder if the President is hoping to appeal to these Iranians.